Just as quickly as it showed up on Net A Porter, it vanished. I have been waiting like a child waiting for her birthday for this bag. Anxiously waiting to see what it will truly look like. To be honest, I am feeling let down. I am sure each version of the Fendi Rainbow Clutch differs slightly, adding a more subdued hue of yellow, blue, pink, or green, but the colors shown on NAP are more bold than I imagined. In fact, this is almost a blessing in disguise, as I am on the wait list for this bag at my local Fendi boutique and if the bag they want to gives me looks like this, it is not for me. What I love about this Fendi Handbag is the oversized appeal, with the chunky stitching and Fendi buckle detailing. 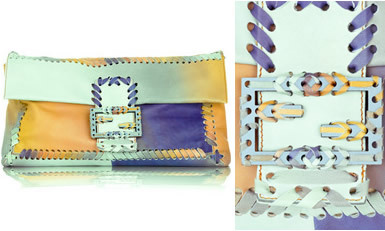 The mixture of colors is that of tasty sorbets and the leather is supple as it comes. Fendi was one of the leaders in bringing the Art trend for their spring line. This is still a total hit for me, but not the exact bag shown. What gives me hope is knowing that each bag’s color will vary. So if this works out, it means the bag will be the perfect light hues (as seen on the runway) and I will hopefully get it towards the end of this month. Keep checking back with Net A Porter, as this bag may come in stock again, but will sell out soon each time. So I am crossing my fingers to those at Fendi, that when it is my turn for this bag, my colors are toned-down hues of rainbow perfection. Price is $1950.